Mohammed al Zawahiri, the younger brother of al Qaeda emir Ayman al Zawahiri, and two other jihadist ideologues have released a statement criticizing the Democratic Jihad Party in Egypt. Ahmed Ashush and Jalal Abu Fotouh, both of whom are leading figures in Ansar al Sharia Egypt, are Zawahiri’s co-signatories on the statement, which was translated by the SITE Intelligence Group. “Jihad and Democracy are opposites and don’t mix,” the three jihadists argue in the opening lines of their statement. They add that democracy is “one of the greatest deceptions used by the enemies of” Islam and pushes people away from their obligation to perform jihad. The Democratic Jihad Party was formed by former members of the Egyptian Islamic Jihad (EIJ), a terrorist organization that was headed by Ayman al Zawahiri before its merger with Osama bin Laden’s operation, and other former jihadists. Mohammed al Zawahiri headed the EIJ’s military committee during the 1990s and was responsible for overseeing the organization’s terrorist operations. Ashush was also a member of the EIJ, and admittedly consorted with leading EIJ figures in Afghanistan in the early 1990s. Mohammed al Zawahiri and his two allies bristle at the notion that al Qaeda’s emir would approve of the political party. The statement by Mohammed al Zawahiri, Ashush, and Fotouh was published by the Al Bayan Media Foundation on the group’s Facebook page and jihadist forums. Al Bayan’s Facebook page is updated infrequently, but posts on the page are decidedly pro-al Qaeda. On June 6, the Al Bayan Media Establishment republished Ahmed Ashush’s statement blasting Tunisian Islamist Rached Ghannouchi. 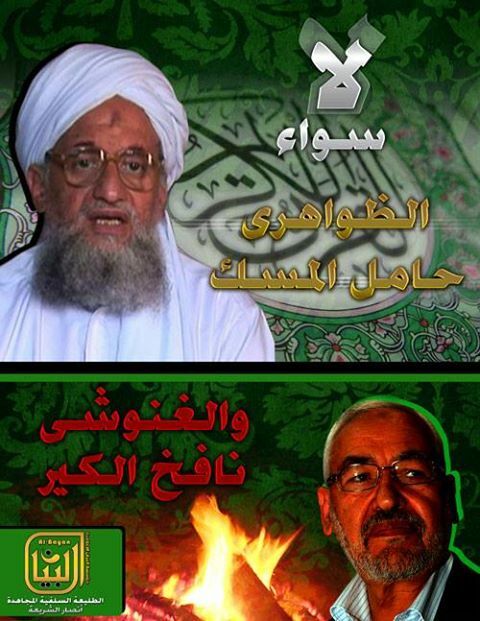 One year earlier, Ghannouchi had criticized al Qaeda emir Ayman al Zawahiri, whom Ashush openly praises. Ashush responded at the time, claiming that Ghannouchi is a hypocrite who compromised his principles in the name of democracy. In contrast, Ashush argued, Ayman al Zawahiri should be praised for his “truthfulness and dedication” and for fully realizing the dawa (or call) of Sayyid Qutb, the intellectual godfather of al Qaeda and like-minded groups. In April, the Al Bayan Media Foundation’s Facebook page advertised a then recent message from Ayman al Zawahiri that was disseminated by al Qaeda’s As Sahab propaganda arm. Al Bayan also posted a link to the video. In March, Ashush’s eulogy of slain al Qaeda leader Abu Yahya al Libi was re-posted by Al Bayan. In February, Al Bayan published a message by Fotouh calling on Muslims to support the jihad in Mali. Mohammed al Zawahiri, who is featured at Ansar al Sharia Egypt’s events, has also attempted to rally public support against France’s role in Mali. In January, the younger Zawahiri hosted a protest outside of France’s Embassy in Cairo and threatened the West with retaliation. Banners featuring Zawahiri’s older brother and Osama bin Laden were featured at the event. One of Mohammed al Zawahiri’s followers was also killed while fighting in Mali in May. In September 2012, just days after the pro-al Qaeda rally in front of the American Embassy in Cairo, Al Bayan published a message from Ashush calling for the makers of the film “Innocence of Muslims” to be killed. The latest statement by Mohammed al Zawahiri and his allies is cut from the same cloth as their previous missives.